The chapters in my book coincide with the first year check up ages: Newborn, two weeks, two months, four months, six months, nine months and twelve months. The book is organized primarily by age and then subdivided by topic. Topics in each section are intended to help prevent future problems. Parent questions are used in each section to highlight important topics. Often the ages of children in the parent questions do not correlate with the chapter age. These questions are included not based on age of the child in question, but on the relevance of the topic. After eight children, fifteen years of pediatric medicine and four years of answering questions on my parenting website, I see what parenting issues families frequently fail to address. There are many books that tell what children should do at each age, but there really isn’t a book that tells what parents should be doing at each age. The primary goal of this book is to help parents address and avoid the most common first year pitfalls. The timeline shown below is intended to highlight these areas. 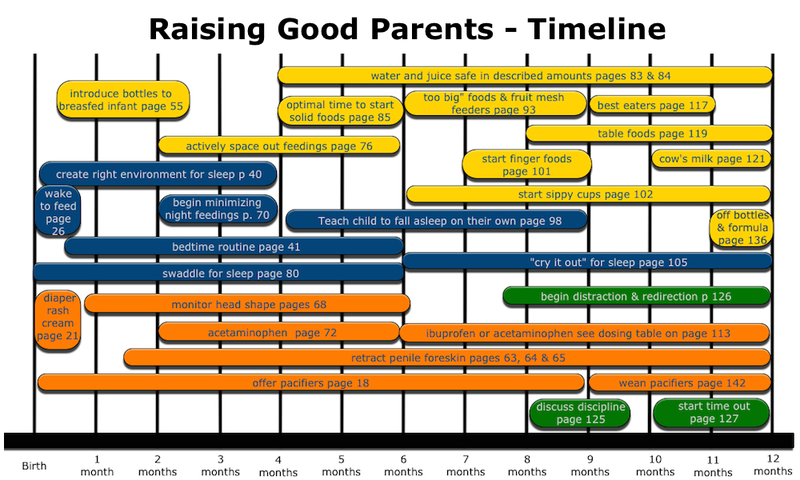 It is a timeline of when parents need to address common first year issues. Hopefully, it will serve as a quick-reference guide to show parents when they need to act to avoid common problems. The page numbers on the timeline correlate with topics addressed throughout the book.